As the album cover would suggest, indie label Strategic Tape Reserve’s split EP is extremely glitchy. Released on cassette, and featuring artists moduS ponY and VLK, the bands sent samples to each other and allowed full creative freedom to write songs with them. Providing aural fever-dream-like symptoms, almost similar to Ween’s The Pod in its almost arhythmic absurdity, the EP starts with “Sans Phosphate” – moduS ponY utilizes portions of samples and electronic drums to create an off-kilter rhythm, later adding standard instruments like kit drums and guitar. Buzzing in like a hive mind, “Human Consumption” features piano in addition to filtered drums, bass and samples. Airy and reverb-heavy, the chords are high pitched and severe. A dizzy lead guitar transitions listeners out as tracks are stripped away. Matt described certain songs, like “Infrequency,” as being “like an electroacoustic duet,” in the way that he wrote his improvised guitar part over a sample of a synth drone sent to him by Eamon Hamill [Ackerman]. VLK’s side B is a bit more minimalist, not only in use of samples, but instrumentally as well. “Compliance With Dreams,” growls from a low, wet place, and subsides to a place of textured emptiness that only tape hiss can provide. The low growls converse with plinking synth leads and electronic zapping, and the listener is forced to be attentive to each sound as it falls into place like tokens in a coin pusher game. Just when listeners feel like they understand what’s going on, Hamill flips sounds on their head. The absurdist aspects of Hamill’s music are apparent – utilizing laugh tracks in “Gallic Shrug,” and applause in “Chic Cevapicci” – but understanding his process is instrumental in seeing it as Dada art. He processes samples first through graphic modular software, creating “unpredictable transformed variations of the sounds,” and arranges pieces of these “into some kind of semi-structured song narrative, with a few of [his] own synth parts added,” [Hamill]. Applause in “Chic Cevapicci” breaks down rhythmically creating a drum beat. A lead guitar wanders over, as more samples layer in. Each, although they appear initially awkward, fit snugly around one another. Midway through the song at the end of the measure, the drums drop confidently, making way for glitching ambience. 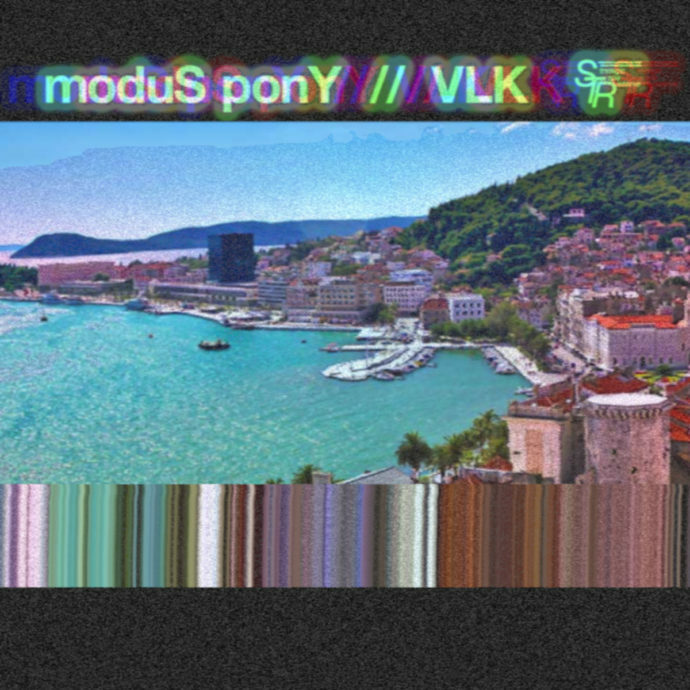 The cover being of the Croatian port city, Split (self described, “bad visual pun,” to keep in STR’s tradition for split EPs [Hamill]), and samples used from Sicily as well on a song called “Black Lasagna” from Side A, there is a vague sense of theme. Eamon said, “I feel that we can get away with claiming that there is at least some kind of Adriatic vibe to the release. Maybe?” [Hamill]. Adriatic or no, there is certainly a juxtaposition in emotional response to the songs. The same can be said about the rest of their bodies of work, whether it’s samples from Shaquille O’Neal’s second album (VLK), or advertisement and speech samples (moduS ponY), both bands have found a way to mix humor and dread, comedy and tragedy. The split is a wonderful introduction to either band.